Solid Georgian brass, single plate size 95 x 95mm, double plate size 95 x 155mm. Polished brass Georgian 6A rocker light switches. Available with white or black insert switches, please select colour type when ordering. Intermediate switch also available were a second switch is used to operate the same light eg.landing light. Polished brass Georgian 13A switched plug sockets in polished brass Georgian style. Available with white or black inserts, please select colour type when ordering. 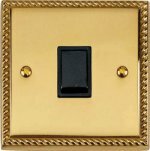 Polished brass Georgian 2 way, push on/off, dimmer switches, available in 250 or 400 watts. Polished brass Georgian 13amp fused switch. Available with white or black inserts, unswitched, with switch, switched with neon light. Please select type when ordering. Polished brass Georgian 45amp cooker unit with 13amp plug socket. Available with white or black inserts, please select colour type when ordering. Polished brass Georgian shaver socket. dual ouput voltage of 110 and 240 volts. Available with white or black inserts, please select colour type when ordering. Polished brass Georgian TV / Coxial sockets. Non Isolated for use where one outlet socket is required. Isolated for use where multiple oulets with signal amplifier is used. Available with white or black inserts, please select colour type when ordering. Polished brass Georgian master and extension telephone plug sockets. Available with white or black inserts, please select colour type when ordering. Polished brass Georgian 5 amp round pin plug sockets in polished brass Georgian style. Available with white or black inserts, please select colour type when ordering.